Halloween is quickly approaching! I love this time of year. The cool brisk weather, it starts getting dark earlier, and the air just smells different. Although I love summer, I think fall is my favorite. All the good holidays are coming up and all the good shows are starting on tv. All my favorite movies are from this time of year too. Hocus Pocus, Elf, Halloweentown, and Die Hard. I watch more cheesy movies between September and December than I do any other time of year. And I love it. When my husband and I got married I started a Halloween countdown. It was a tradition someday to pass on to our children. 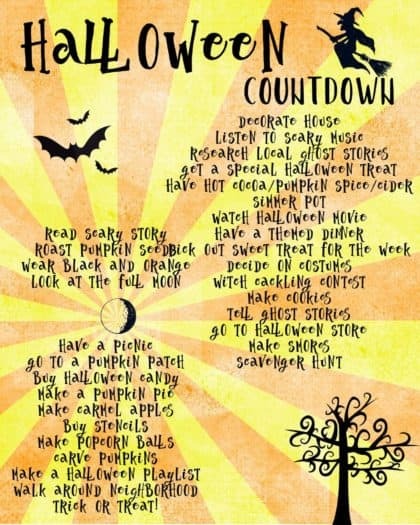 I’ve always thought countdowns should be used for every holiday/special occasion. So we’ve done a special Halloween one every year. It’s a 31-day countdown, for the entire month of October. We have a different special activity to do every day. I make them pretty simple so that on work days we’re not trying to do anything crazy. The above list are things that we have done in the past. I also put this cute DIY countdown in our shop. You can buy this printable and then print it out, cut out the windows, add your own activities and you’re done. 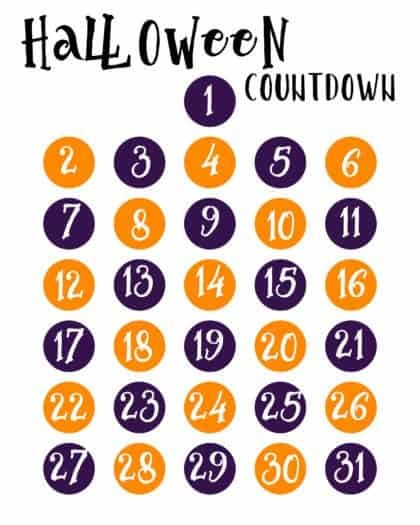 Or you can use the freebie Halloween countdown that you can get in our freebie VIP library by signing up for our newsletter below. What are your favorite things about fall? I’d love to hear in the comments section!